I am preaching in Ardmore, OK, at the BIBLE BAPTIST CHURCH pastored by my friend Pastor Tracy Currington. He has been the pastor here for going on 7 years. He is the founding pastor and is an excellent personal soul winner. Mrs. G had her staples taken out on Wednesday this past week and is in rehabilitation. The work outs have been difficult for her and painful, but she is faithfully doing them. Please continue to pray for her. The INDEPENDENT BAPTIST CONFERENCE is coming to the Milwaukee, WI, area on April 8-10, 2012. One of the preachers will be Pastor Brent Lenetine who pastors the GOSPEL LIGHT BAPTIST CHURCH of Rio Rancho, NM. He came to Rio Rancho not knowing one individual and started in 1988 the GOSPEL LIGHT BAPTIST CHURCH. Recently they completed a new auditorium and had 650 on their first Sunday and are averaging just under 500 each week in attendance. This is one of the many young men of God in America who are being used of God to reach their Jerusalem with the Gospel. I have preached for this man for many years and I believe he is a part of a group of the best kept secrets in our nation who are getting the job done for God. Please make plans to be with us at the FAITH BAPTIST CHURCH of Oak Creek, WI, April 8-10. 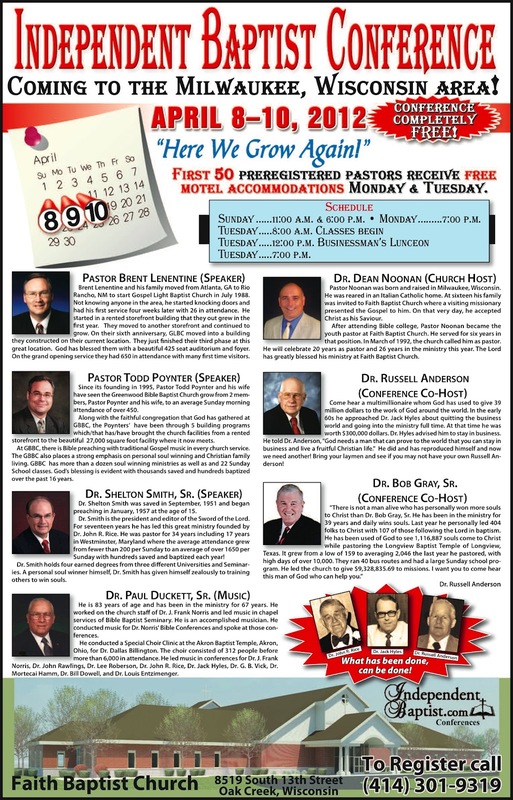 The first 50 pastors who pre-register will receive free motel accommodations. Please call 414-301-9319 to pre-register for Monday night, Tuesday morning, Tuesday luncheon, and Tuesday night. The conference is free with classes being conducted on Tuesday beginning at 9 a.m. for Pastors & Staff with myself, laymen with Dr. Anderson, ladies with Mrs. Noonan, and youth with Matt Kielas. Dr. Shelton Smith, Editor of the SWORD OF THE LORD, and Dr. Paul Duckett Sr. will be with us. Dr. Duckett Sr. led the singing for J. Frank Norris, was on his staff, and taught music in his school. I promise you will sense the Spirit of God with this man’s music. He is the BEST I have ever heard in my 40 years of ministry. GOTTA LOVE OLD TIME RELIGION! GOTTA LOVE THE OLD TIME RELIGION!!!!!!!!!!!! !